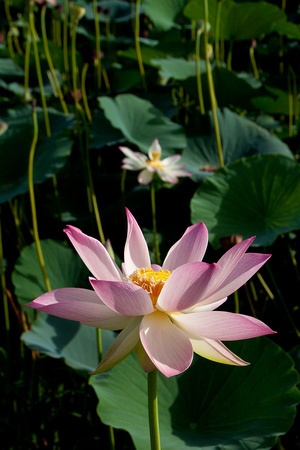 Padma or Lotus, a flower native to India has spread throughout the waterways of the world. This is the Lotus Flower, scientific name Nelumbo nucifera, a flower that I grew up thinking was a water-lily, until I was recently corrected. Water lilies come in a variety of colours, but the Lotus is only found in tones of pink and white, the petals that is, the central seed pod is yellow when the flower is in bloom. The flower is supported by a very thick stem that elevates it above the water and the leaves, the leaves are very large and though are sometimes seen above the waterline, they generally float on the water. It is hard to walk the length of Guyana’s coastline without seeing ponds or other waterways (yes, the trenches and canals) filled with these flowers. With a strong Hindu culture, these flowers / plants are a part and parcel of the Guyanese heritage. These are often used decoratively, as live plants for their colour and size and even as dried arrangements, especially in the case of the central seed pod (which resembles a watering can) which is the part most often used in dry arrangements, I seem to remember seeing it painted gold in a dry arrangement once when I was a child. In Guyana (and parts of Suriname and Trinidad) the tradition of using the leaf at functions is very common, this too is a tradition handed down through the Hindu religion brought from the far east. 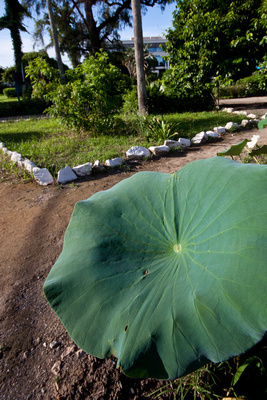 Across the coastal regions of Guyana there is not a weekend that goes by without a Hindu Wedding or Jhandi, at both functions there is the traditional Hindu ceremonies conducted by a Pandit and when the time comes for the sharing of the meal, it is served in a leaf from the Lotus plant. Jhandi actually means flag, but has come to refer to the ceremony that culminates in the planting of that flag, the ceremony is an offering of thanksgiving to Hanuman (a Hindu deity). Over the years both Nikhil and I have taken photographs that either include or centre on the Jhandi flag. A fascinating plant, and there probably isn’t a Guyanese who owns a camera who hasn’t taken at least one photograph of it. Seriously though, I love learning stuff like this. It brings a whole new dimension and interest to something that has become routine. Excellent post. My two favorite kinds are flowers are those just budding, and those accompanied by a creature (which is usually as colorful or lively as the flower). I just can’t resist them. 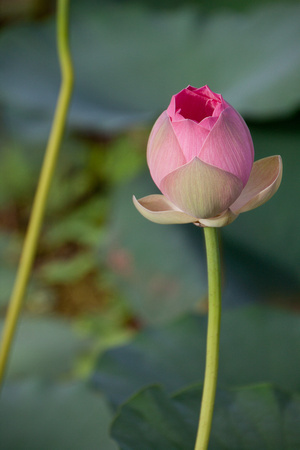 The budding lotus flower has a wonderful softness to it. Love it!